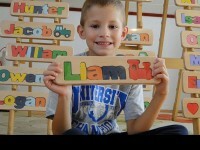 As a special gift, you will receive a free wooden toy wooden horse with every purchase of a name puzzle. 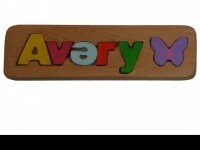 -Wooden Puzzle Name are made out of Hardwood beech which is light colored and very sturdy . 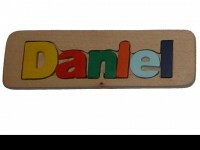 -All edges are rounded and sanded smooth then finished a non-toxic spray finished. 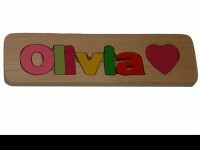 Wooden Name Puzzle is a perfect personalized gift for a new born or any occasion. 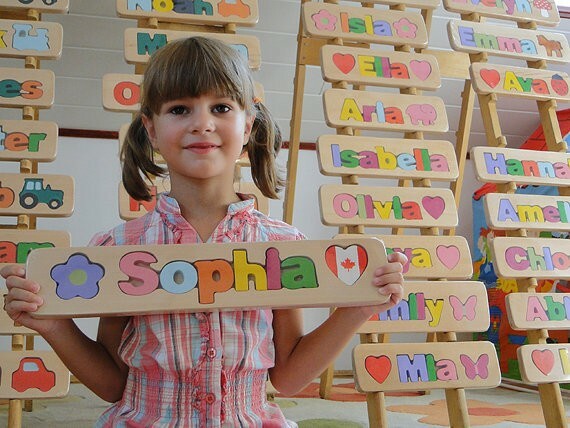 Learning how to recognize and spell their own name is one of the most important early development skill your child will learn, and puzzles teach your child problem solving skills and to coordinate their thoughts & actions. 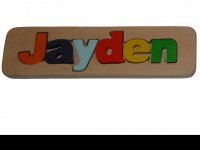 These puzzles are a great educational tools that help your child enjoy learning their letters and to start recognizing the spelling of their names and other simple words. please indicate the gender of the child and the special request. 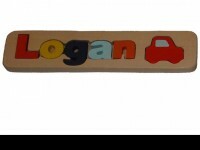 Symbols include: car, train, tractor, ladybug, flower, heart, mushroom, elephant, horse and many others. Returns Policy You may return new, unopened items within 15 days of delivery for a full refund. We'll also pay the return shipping costs if the return is a result of our error (you received an incorrect or defective item, etc. ).You should expect to receive your refund within four weeks of giving your package to the return shipper, however, in many cases you will receive a refund more quickly. This time period includes the transit time for us to receive your return from the shipper (5 to 10 business days), the time it takes us to process your return once we receive it (3 to 5 business days), and the time it takes your bank to process our refund request (5 to 10 business days).We'll notify you via e-mail of your refund .